Who's doing what - in your neighborhood? The Free EyesAndFeet application has all the details! Here are the top 10 (based on number of followers) restaurants that tweet, along with a summary of what they do that's unique and beyond special offers and greetings on special occasions. And just to keep it fair, we haven't included the big chains (McDonalds, Starbucks, etc) in this analysis - so there you have it, all independent establishments! The Grumpy Cafe is not so grumpy with their tweets. They have a simple yet powerful twitter strategy with interesting pictures and links associated with several of their tweets. Catches the 9th spot by just 2 more followers - so their position on the list could change by the time you read this. Foursquare is a key ingredient in Smith Restaurant's twitter effort. The gourmet oyster joint is "fishy" in most of their tweets - with quirky replies to their fan's tweets. ReTweets and simple and prompt engagement seem to be the corner-stones of this All Natural Slush Eateries' twitter account. Events, Events & More Events. That's the dominant theme of this twitter account - with simple yet powerful tweets to attract their customers over to their restaurant. A hot soup on a cold windy day is oh so perfect. This swanky Scandinavian restaurant knows that only too well as is obvious in their yummy, timely, weather-synced tweets. Being a mobile food truck, their use of twitter is very functional. Besides replying to a legion of regulars, they also issue regular reminders on where their next pitstop will be. They are very ebullient with their feedback and friendly replies. Many of their tweets involves fast & witty responses to their customer's queries. Probably in sync with their coffee concoctions, their tweets have the right proportions - of replies, specials and offers. 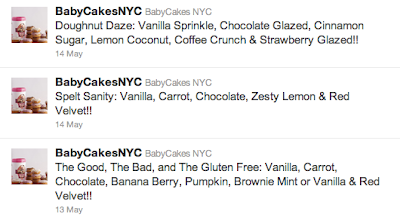 The yummy cakes baked by New York's famous Baby Cakes bakery are well complemented by their simple but powerful mouth-watering tweets involving many of their recipes. This along with 'the usual' - replying promptly, announcing specials & events at regular intervals makes then New York's No: 1 eatery on Twitter. Check out Eyes And Feet for more on local business' social media in YOUR neighborhood.